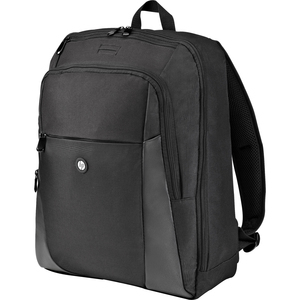 A durable backpack designed to fit notebooks up to 15.6" diagonal inch screens. Padded adjustable straps provide comfortable fit. A zippered MP3 player pocket provides a headphone port to keep your player safe and convenient. Zip down front compartment holds smaller items like pens, business cards, USB sticks etc. Padded materials in main compartment help protect your notebook.